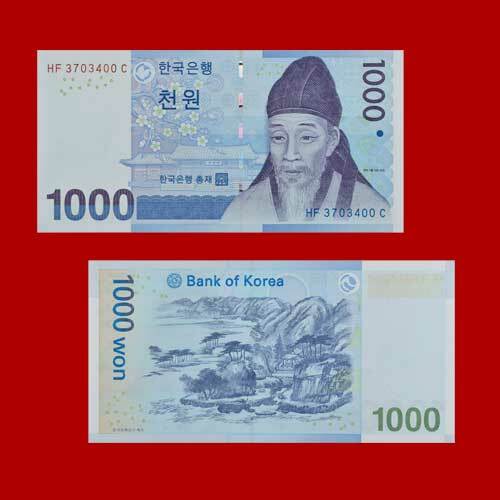 The one thousand Won was issued by South Korea in 2007, it is classified as Series III. The original size of this note is 136X 68 mm. This banknote is printed with colour purple and blue on multicoloured underprint. A legend in Korean script is printed on top centre with the serial number on the top left and bottom right with two syllabuses in Korean below it. The portrait Confucian scholar Toegye (Yi Hwang; Lee Hwang) is seen on the left with Myeongryundang in Seoul, which was a foremost educational institution and a Confucian school with blossoms of Ume flower in the background. The denomination in English numeral is print on both top right and bottom left. The two features, there is also an illustration of plum blossoms on the obverse side of the banknote. The plum blossom was a plant that Scholar Yi Hwang personally held in high esteem, in which the plant itself represented his graceful personality. The legend ‘Bank of Korea’ is printed in English script on top centre. It also features ‘Gyesangjeonggeodo’, a painting by the famous artist Jeong Seon of the Joseon Kingdom in the centre with the denomination on the top left and bottom right. Jeong Seon was a gifted Korean painter who is well-known for producing admirable traditional artworks depicting natural scenes throughout the land of Korea. The Gyesangjeonggeodo depicts Scholar Yi Hwang writing a piece of literature in Gyesang Seodang, which is yet another private academy set up by the renowned scholar in his hometown of Andong. ‘Gyesangjeonggeodo’ literally means ‘The Painting of the Tranquil Residence by the Stream’.